Poached eggs on buttered English muffins have been something I’ve been eating as long as I can remember - they always make me think of my grandmother. My grandmother was a poached egg master - always using a pan that was not too deep and spooning the water over the eggs to help cook them more evenly. 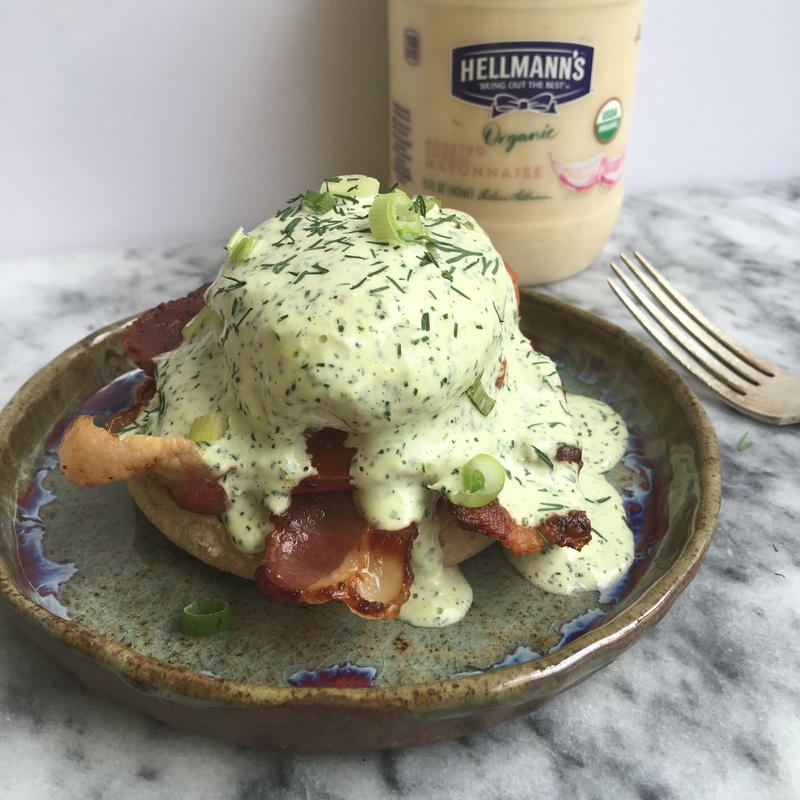 I’ve done a lot of growing since those days around the table with grandma in Florida - and this version of Poached Egg over English muffins is all grown up -paired with an incredible roasted garlic herb sauce using Hellmann’s new Organic Roasted Garlic Mayonnaise. The roasted garlic flavor provides just the right amount of backbone for the sauce without being over powering. I don’t know about you, but I spend a lot of money on good, quality eggs - and it is nice to know that there is now an organic mayonnaise that does not make me feel like I am doing a disservice to the eggs by adding a sauce - I used the Roasted Garlic in this recipe, but their other two flavors, Spicy Chipotle & Original would also work well. Slice tomatoes in half and toss in a large bowl with olive oil, salt and pepper - on a baking sheet, roast tomatoes for 2 hours, turning them halfway through. Tomatoes can be made up to three days in advance and stored in an airtight container - when ready to use, allow to come to room temp. Line a half sheet pan with heavy duty aluminum foil - place bacon on pan and bake in oven until crisp, but not burnt - about 15 minutes (flip bacon halfway through) While bacon is cooking, bring 2” of water to a simmer in a medium saucepan with 1 teaspoon white vinegar. Working one egg at a time crack egg into small bowl and gently slide it into the pan-continue to add eggs until all are in the water -poach until whites are set and yolks remain runny - about 5-6 minutes. Remove from water with a slotted spoon and set aside on a paper towel lined plate. Split 2 English muffins and toast. To assemble - place half an English muffin on each plate, top with 2-3 slices of bacon, 2 halves of roasted tomatoes, 1 egg and sauce to cover - serve with additional sauce on the side, and a light salad, if desired. This recipe was sponsored by TheFeedFeed and Hellmann’s - thanks for supporting the brands and products that support me.